Often known as a charlie horse, muscle cramps in the legs, calves, ankles, or feet are typically caused by dehydration, mineral deficiency, strenuous activity, awkward sleeping positions, or reactions from certain medications. Leg pain could also indicate more serious conditions that require the attention of a medical professional. These usually do not require professional medical treatment, but can be treated by increasing the intake of water and getting sufficient rest. If leg cramps are persistent, or if you experience other serious symptoms, you should consult a medical professional immediately. For those who experience chronic muscle cramps in their legs, there are several treatment options to consider. Studies have shown vitamins and minerals, like magnesium and potassium, may prevent the onset of such cramps. This is especially true for runners, athletes, and pregnant women. You should consult a doctor before changing your medical habits. Once leg cramps begin, there are several ways to alleviate the pain. Get up, move around, stretch, and shake off the cramps. Apply cold compresses to the affected muscles. Over the counter pain relievers are also sometimes effective. If your muscle cramps last for a period of several days, you should consult the medical professionals at FastMed Urgent Care. We provide high-quality, convenient, and affordable care. Our offices offer extended hours that meet your busy schedule. We accept most major insurance plans, including Medicare and Medicaid and offer a self-pay discount program. We also do not require appointments. 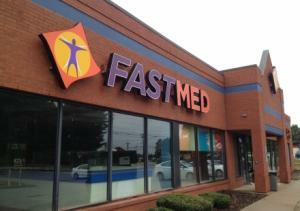 Simply come in to your local FastMed Urgent Care clinic, and our medical professionals will typically have you seen and back out on your way in under an hour. Contact us today and let us help relieve the muscle cramps in your legs.